In the lead-up to ChallengeMD! 2006 Vietnam, long time supporter of the MDA Barry Michael held a fundraising night to benefit MDA. The funds raised contributed to the overall success of ChallengeMD! 2006. During the course of the evening Barry introduced MDA Executive Director, Boris M Struk to Graeme Gidding, Variety’s Sunshine Coach Chairman. It soon became evident that there was a particular synergy between Variety and the MDA and the wheels were set in motion to provide the MDA with a “Sunshine Coach”. 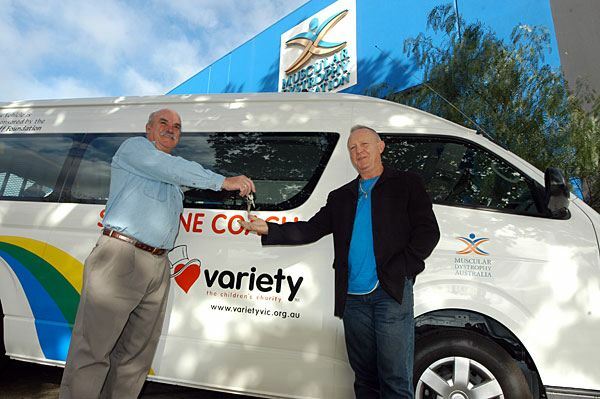 Following the conclusion of the Commonwealth Games held in Melbourne, transportation used to ferry athletes to competition venues became “surplus” and Variety was able to secure a bus for the MDA. The Jack Brockhoff Foundation generously provided the significant funding required to outfit the new vehicle with electric hoist, wheelchair access and tie-downs. In addition, seating was configured in such a way that maximum flexibility has been afforded to the MDA’s needs. The MDA community appreciates the support of Variety – The Children’s Charity, The Jack Brockhoff Foundation and Barry Michael – You have all Made a Difference!